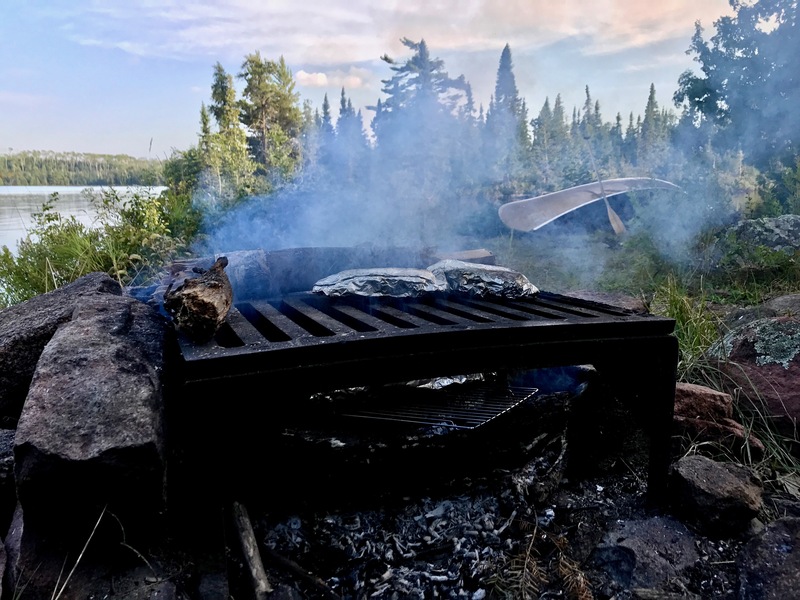 The BWCAW represents the best aspects of The Land of 10,000 Lakes. 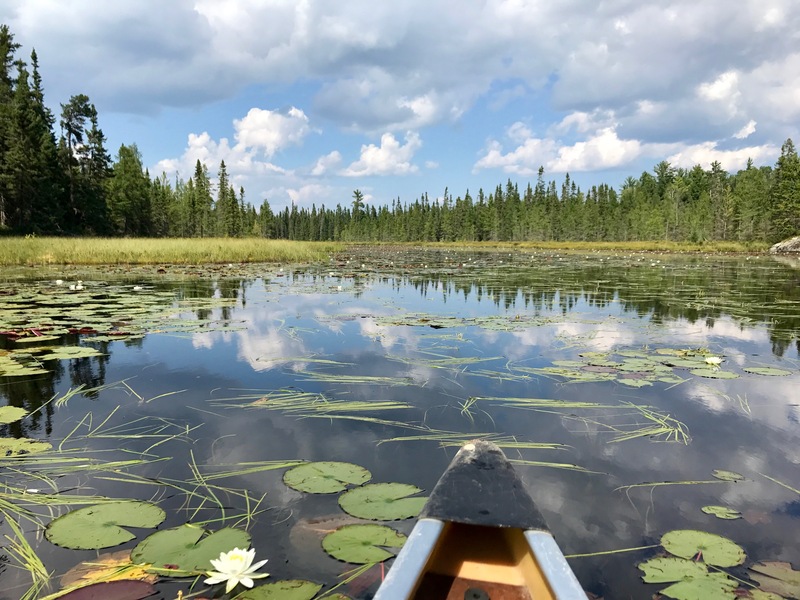 All the wonder and variety of lake ecosystems: freshwater fish, frogs, chirping night crickets, painted turtles, loons, redwing ducks and water bugs. All the solitude, quiet and calm of nature. 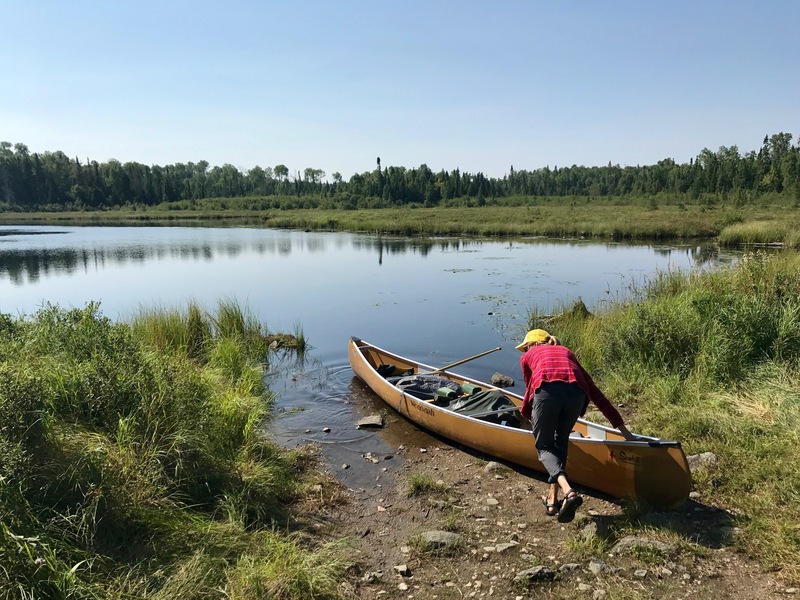 The common way to explore wilderness involves hiking with a backpack, but here that is replaced with paddling a canoe deeper and deeper into a heavily forested water system unlike anything elsewhere in the world. 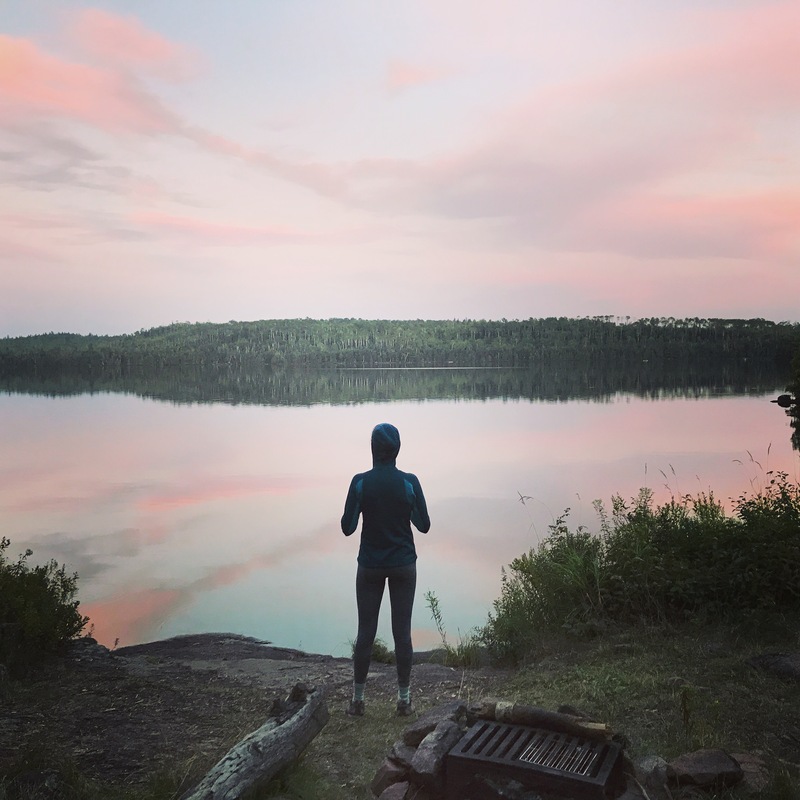 I’ve been in the BWCAW on two prior occasions. On my first self-led backpacking trip I had an unforgettable adventure paddling a canoe in enormous waves. 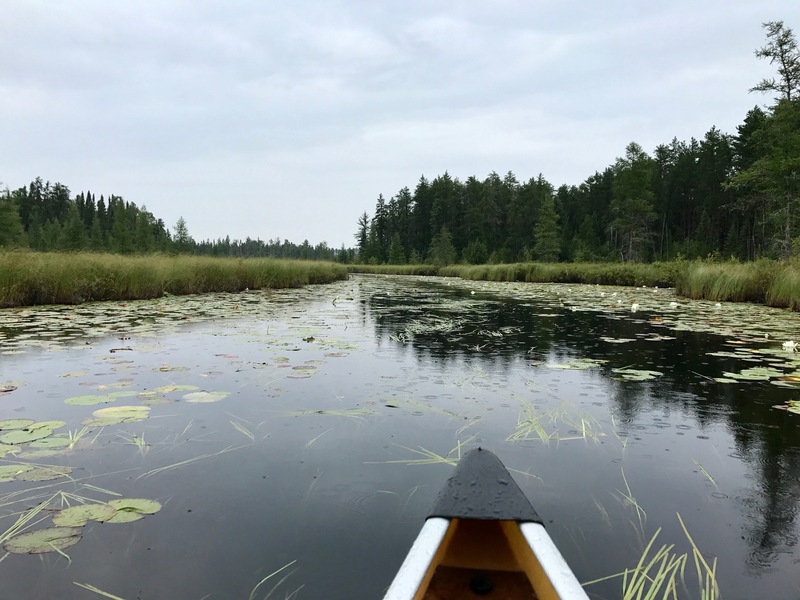 This time I wanted to experience a different part of the BWCAW by entering on the more Eastern flank which hosted smaller lakes mostly connected by rivers and portages (carrying the canoe over land). 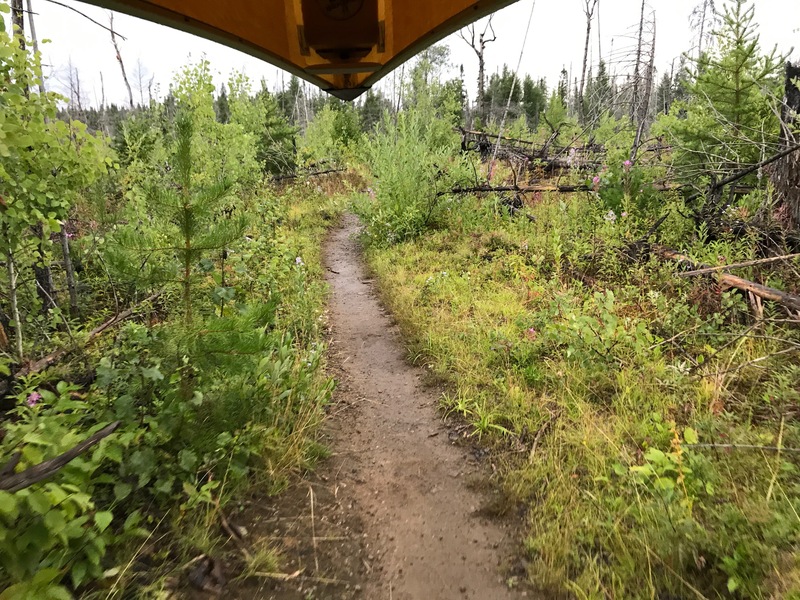 I landed on entering from Kawishiwi Lake and ending in Sawbill Lake along the Lady Chain Loop. If you are pushing it you can complete this 26 miles, with four cumulative miles of portaging, in two days. However, we wanted side-trips, time to fish and an easy pace so we would take five days. We got a late start of on the first day so we started paddling our loaded down canoe when it began to sprinkle. 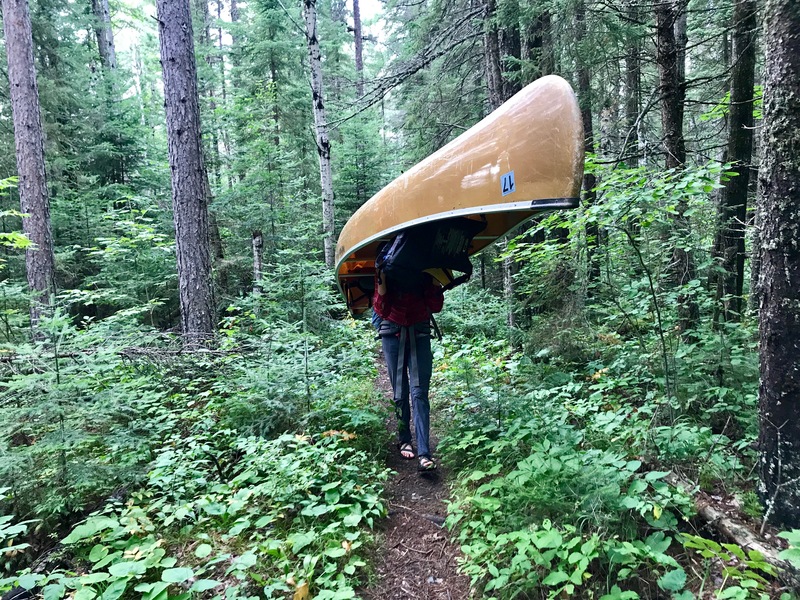 It wasn’t enough volume for me to put on rain gear, but my pants became soaked anyways as they absorbed the water clinging to every piece of wet foliage on my first portage. After three hours we made camp on Poly and hurried to get it in order at Sunset. Minnesota mosquitos become incredibly active at dusk and can multiply 10x how many you see in the day. 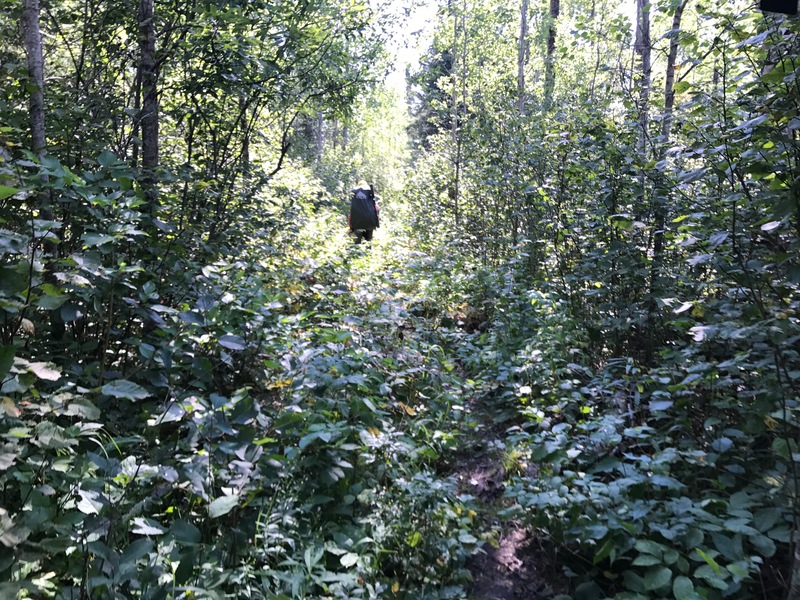 I performed the last task of hanging the bear bag in the dark, constantly walking in circles while several hundred mosquitos swarmed, hoping to devour me. Finally, inside the tent, it was something of a plague. When I unzipped the rainfly a swarm of these insects poured out the opening like angry bees rushing from a hive. I waved my hands hoping to clear the air before I unzipped my side of the Big Agnes tent, dove in and zipped the mesh behind me. I didn’t even reach back out to close the rainfly. Immediately, Sadie and I began killing the dozens of mosquitos that had followed me in within that short time in a headlamp assisted mechanical search and destroy precision. Leaving even one can disturb sleep with frequent phantom bites to augment the real ones while buzzing occasionally nears your unprotected face, arms enclosed in your sleeping bag. Looking out from the mesh security of our tent we saw over two hundred mosquitos resting between the rainfly and the tent mesh. The buzz of all the active bugs was an audible drone that would dampen with a breeze and then regain intensity with still air. I went to sleep and woke up a couple hours later when it had started to rain. Typically mosquito activity dies down a couple hours after dusk but upon illumination of headlamp I remained under siege from a large force of bloodsuckers. Regardless, I had to close the outer rainfly earlier abandoned in an attempt to keep my gear dry. In a flurry, I exposed an arm-sized hole in the mesh door, zipped the rainfly and closed the protective mesh behind me. Over the course of a couple seconds of constant motion, my arm had collected eight mosquitos along my arm with their needles plunged into my skin. After another internal bug cleanse of the tent we could return to sleep. For the entire next day, we were stuck inside the tent due to decently heavy rain. It had no effect on the besieging mosquitos already inside our rainfly. Over the course of the day, we began killing every one of these mosquitos by crushing them between the tent mesh and the rainfly from inside the mesh safety. Near the end of the day, I counted one hundred of the small carcasses. The count of the swarms I wrote earlier now healthy extrapolations rather than exaggerations. We forewent dinner the night prior due to the mosquitoes and again barely ate all day due to the rain. Midday I shortly emerged from the tent to lower the bear bag and acquire some sustenance. Enough water had fallen to create small pools and our gear even under the rainfly was getting pretty wet. Somehow, while outside the tent and becoming soaked in a moderate rain there were still a few mosquitos flying around!!! After a day of rain, it finally lightened at nightfall but we forewent dinner again. Wary of being stuck outside in another mosquito attack. Luckily after all our efforts to clear the tent only a couple dozen mosquitos populated the inside of the rainfly towards dusk. Thankfully, we didn’t experience the bugs in this intensity for the rest of the trip. On day three I was happy to be out of the tent and moving again. The day involved some really spectacular canoeing unlike any of my prior trips. We traveled up the Kawishiwi River in a stream as shallow as a foot in places and often 25 ft wide. Reeds line both sides of the river while water plants rose from the dark muddy depths towards the surface, noisily brushing against the canoe as we paddled through them. Occasionally this resulted in a beautiful lily pad carpet across the water. We crossed 4-5 beaver dams this day. Some of them fairly successful, raising the water on one side several feet and requiring us to get out of the canoe and pull it over. We witnessed three beavers swimming around in the water and even were given a defensive water-slap of the tail by one. The portages were mucky, steps would often plunge 2-12 inches deep through an opaque mud-water mixture until becoming solid. 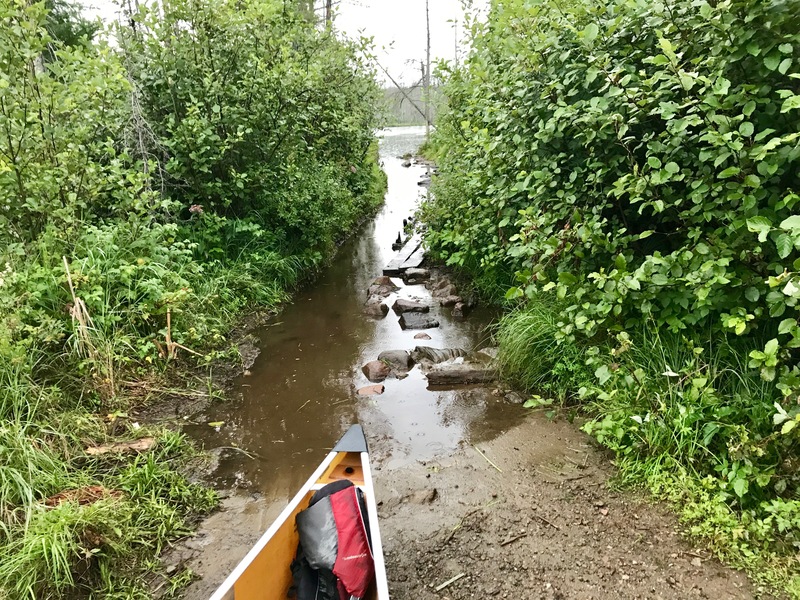 The downside of carrying a canoe is you often cannot avoid this muck in the center of the trail by walking around the side. Attempting to do so can easily throw you off balance as the canoe brushes against branches or point your canoe nose in such a way you run into a tree. Finally, we ended on one of the larger lakes for the night and made a proper dinner. Augmenting our noodles with cheesy nutritional yeast, sesame seeds, peas and vegetable broth we made the best tasting backcountry ramen I’ve ever had! I slept soundly, drifting off to the errie echoing calls of a loon on the lake. We were beginning to see these wonderful birds regularly, diving to spear fish, as we headed East. The next morning I awoke to the machine gun chatter of a red squirrel followed by synthetic buzzing and reverberation of arcade sounds from a dozen birds that could fit into the palm my hand. The squirrel was running around camp gathering pine cones with no desire to grab a meal from me. A nice change from the small animal scavengers found around the National Parks all summer. This morning a heavy cloud had descended that drenched our clothing hung overnight to dry with its moisture. Closest to the water you could see wisps of fog blowing across the surface. In a few hours the sun would burn this off and the mat of water bugs would return. The organic mat appearing as a moving surface to the water as the bugs dance and skip across the water in such heavy density. With all these bugs, this place is basically a fishery given all the nutritional resources! This day we took the time to go fishing and after an hour Sadie caught a Walleye. Her first freshwater fish! Not desiring to portage a fish for a mile we only went a little further to Grace Lake. After a quick skinny dip in our campsite’s shallow, warm, rock-bottomed inlet we made fish tacos. Wrapping the ingredients in foil to cook over our campfire. Our last day I was happy to be heading out. The initial two days of wet and mosquitos had really impacted the fun factor of this trip. The first of the day’s two long portages was a mile long. Over the course of its length, the tension of the 44 lb canoe on my shoulders became intense. A painful strain started to run up my neck and into my forehead. I attempted to counteract the sensation by relaxing my shoulders and shifting the weight. However, neither helped much. Me lugging the canoe and backpack through the woods. However, pain is just a moment in time. 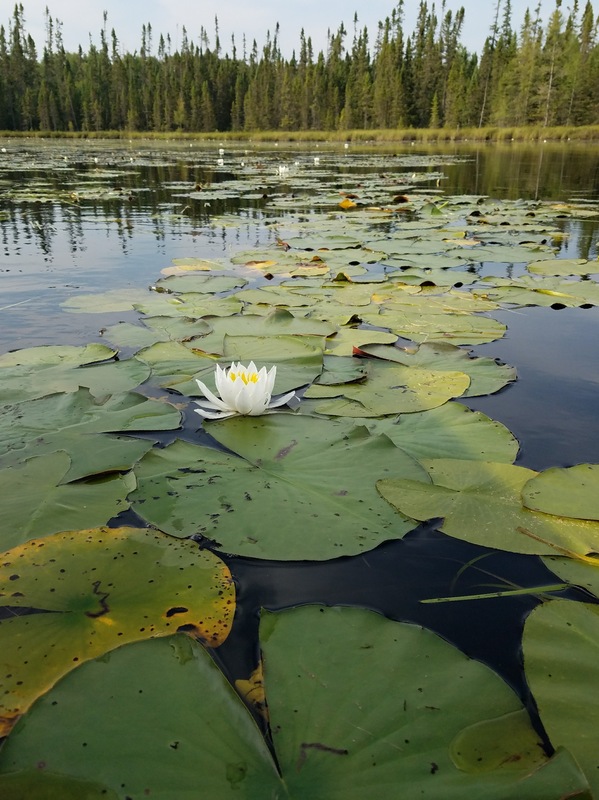 Soon we were back paddling our way to Sawbill Lake to return our canoe. 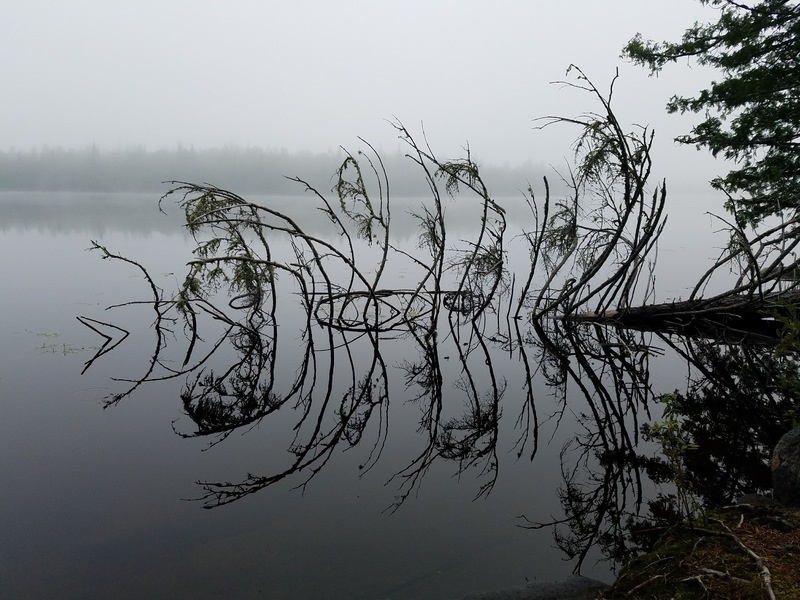 The trip was harder than I expected, however, the BWCAW remains as beautiful as I remember it. A perfect wilderness and natural ecosystem.